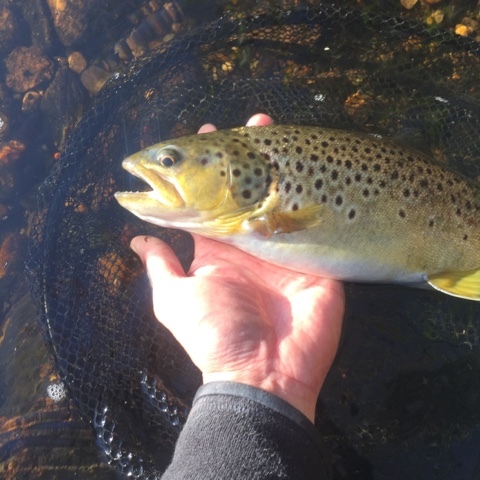 On Saturday, I awoke at 3 am to drive a few hours to fish a few hours. I needed to be back home by noon. The Millers was full of mist when I arrived. The cool air felt great. It was still pretty dark. I was the only angler. I started tightline nymphing, targeting runs upriver from me. Nothing. The fish weren’t in the locations where they were last time. But, I kept going upstream, and, eventually, had a take. 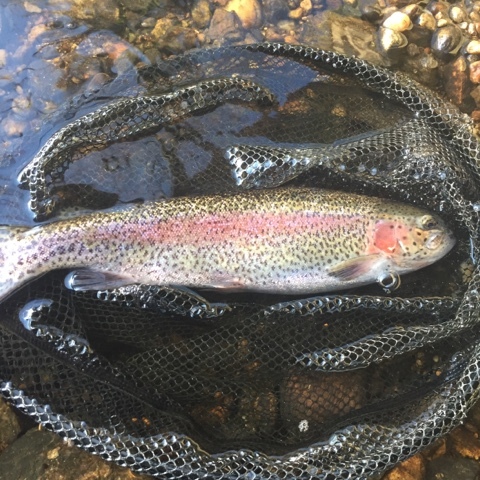 It was a good-sized rainbow that went for a small Frenchie. 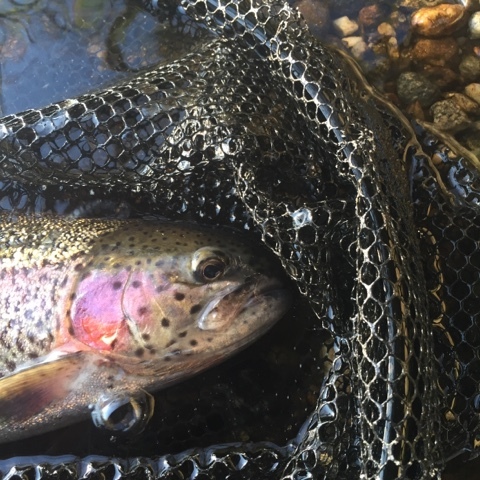 After a battle, it slid into the net, I removed the barbless hook, and let it go its merry way. Soon, I was into more fish. 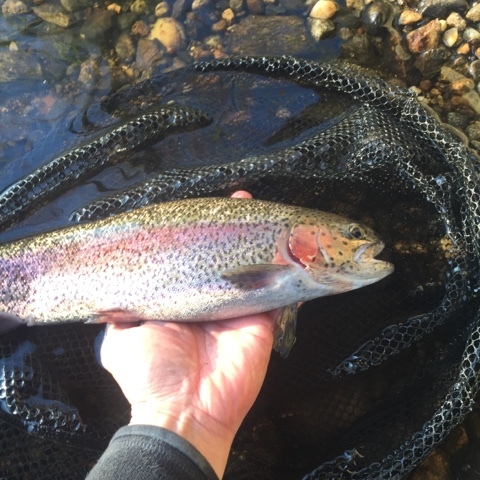 The 16″ rainbow below proved to be tough to tame. I followed it down river and then eased it into the calmer water. As I headed closer to the front of a long run, I felt a very strong take. A fish immediately jumped, and I could see that it was both long and fat. Wow! A shot of adrenaline jumped into my system, both from excitement and fear that I would lose the fish. 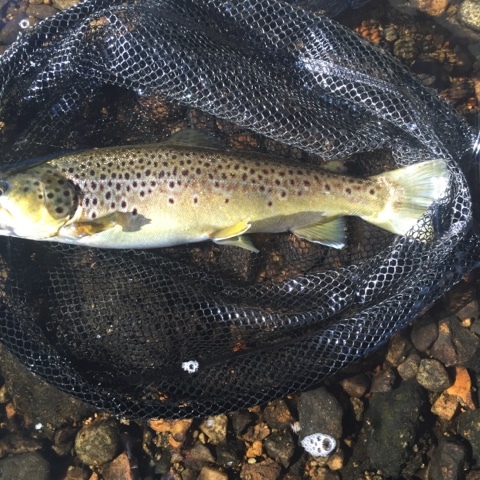 The trout started to burrow deep and shake its head. Then, it jumped again. It pulled line from the reel steadily and with great power. At one point, we were at a standstill. I just couldn’t move it. I read about a technique somewhere online. A little pull will get a fish moving again. It worked. I gave a firm but small tug. The fish soon resumed fighting and jumped again and again for a total of six times. It fought like a landlocked salmon. 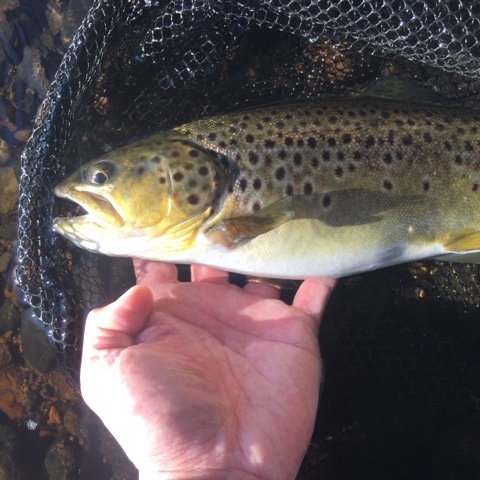 Eventually, I eased a large brown trout into the net. I couldn’t believe the size of its fat stomach. The pictures below don’t do it justice, but it was a splendid display of nature’s beauty, full of olive, yellow, and brown colors and shimmering with life. It was about 16″. I fished more and ended up landing 10 of 12 hook-ups. All were on small Frenchies. Feeling more than happy, I decided to stop fishing early. As I left the river at about 9.30 am, I looked back. The sun was up now, and it was starting to feel warm. I was still the only angler on the river. No one around me. Just the river, the trout, and I.